Innovation is why we come to work everyday. Almost all of our online tools started as internal projects we found useful and decided to share with the community. As the site has grown, we continue to invest heavily to develop new tools and services. Various pricing packages depending on the chosen product. If your business depends on email or web connections (and whose doesn’t these days?) you can’t afford problems with your Internet connections. One particular nightmare is getting your domain added to one of the many DNS-based blacklists out there. If your domain ends up on one of these blacklists, chances are excellent that at least some of the email you send will never get delivered. Beyond blacklists there are loads of other infrastructure issues that can interfere with the smooth running of your business. Problems with your mail servers, DNS issues, and web server glitches can all cause major headaches, particularly when they go unnoticed by your support staff. The team at MxToolbox aims to give you the network diagnostic and lookup tools you need to stay online and running smoothly. To this end, they offer more than three dozen free tools, plus assorted professional (paid) services. In this post we’ll look at how these tools and services can help you and your team keep your business secure and online. Most of the tools in MxToolbox started life as things the MxToolbox staff created for their own use and subsequently shared. You’ll typically work with the tools through the mxtoolbox.com website, although an API is available for organizations that want to integrate the tools and services into their own infrastructure. According to the MxToolbox About Us page, millions of network professionals from around the globe use their services to tackle all sorts of Internet infrastructure issues. 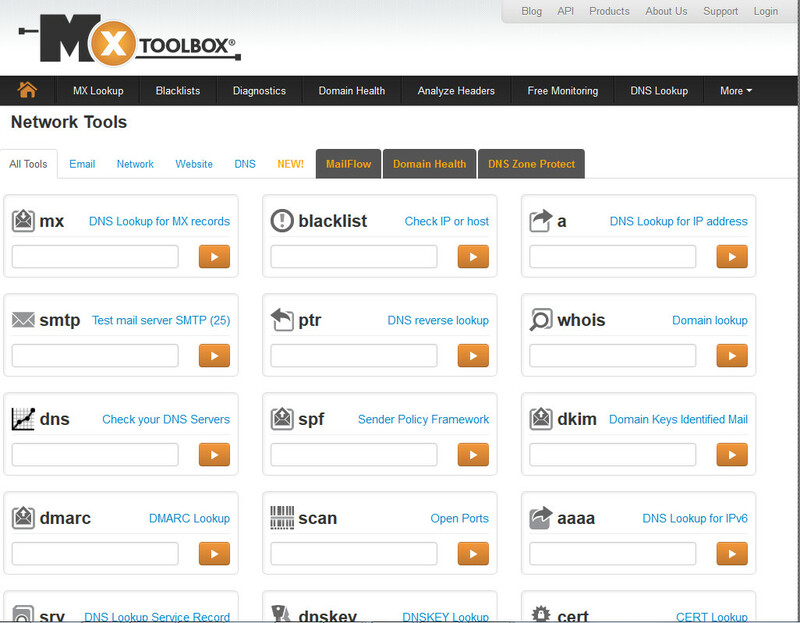 If you have an account with MxToolbox, you will want to log in when you arrive at the site. But you don’t need an account to use their free tools and services. With so many services dealing with so many different aspects of Internet infrastructure, it can be hard to get a good sense for the power and breadth of their offerings. The best way to start is probably to check out their SuperTool. Note: Navigating the MxToolbox website can be confusing at times. Click the heading of a section in this review to go directly to the relevant part of the MxToolbox website. 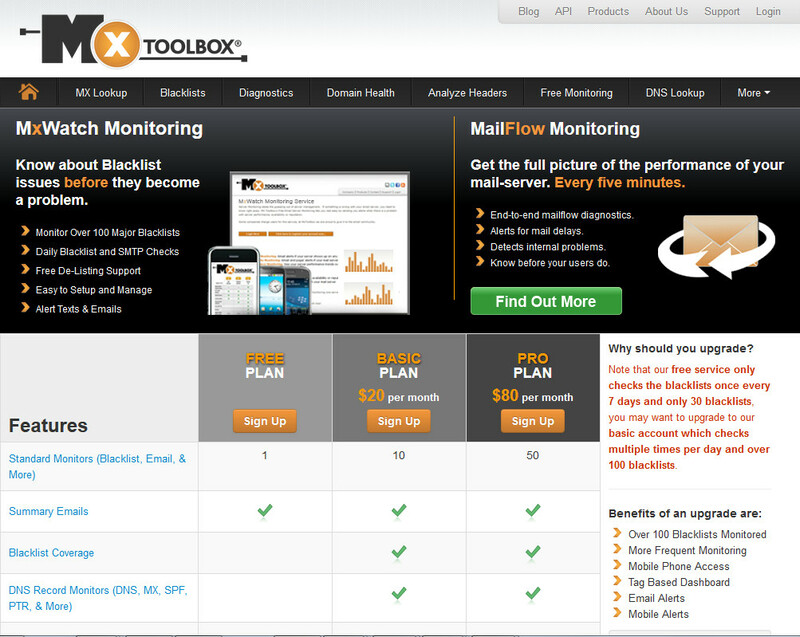 The SuperTool (in beta as of this writing) is an all-in-one doorway to the free diagnostic services in MxToolbox. It lets you run MX record, DNS, blacklist, and SMTP diagnostics all from one location. All you need to know is the domain name, IP address, or host name you want to check. Here are two different ways to use the SuperTool, depending on what you are trying to accomplish. If you don’t have a specific test in mind to start with, you can let the SuperTool guide you. Simply enter the domain name or host name or IP address you want to know more about into the box and press the Enter key. The SuperTool will start its diagnostics by doing an MX record search on whatever you entered into the box. Enter the relevant domain name or host name or IP address in the box. Use the down-arrow on the button to select the specific type of test you want to run. The text on the button will change to match the test you selected. Click the button to start the test. In either case, the results of your test appear directly below the box and button, as you can see in the following figure. Notice that the tool returns much more than just the results of a specific test. It also returns a variety of links. Some of those links will lead you to more detailed information about the results. Other links will lead you to related tests you can run, based on the results of the current test. This allows you to further explore the characteristics of the item you are testing, based on the results of each test. This mix of simplicity and complexity is a characteristic of MxToolbox. You’ll find that the services are very powerful. Perhaps because they are so powerful, you may need to invest a little bit of time with each tool to get the full benefit out of it. 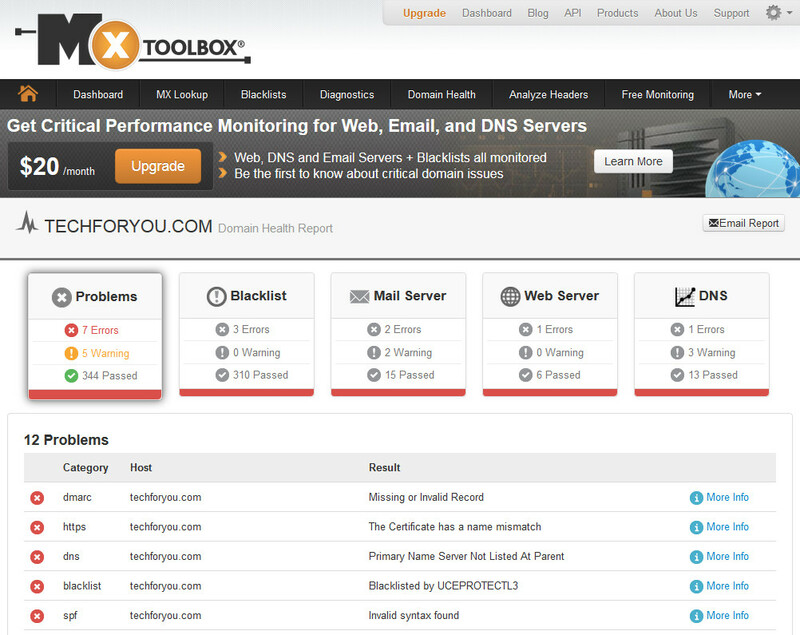 With that said, let’s move on to another incredibly powerful part of MxToolbox, Domain Health. Enter the domain name you want to test and click Check Domain Health. Then be patient. It can take a moment or two to complete the testing. Note that you can also enter an email address here and Domain Health will extract the domain name from it and test using that. Running this check results in a summary page like the one shown below. It shows you how many Errors and Warnings it spotted in each category, along with the number of tests that Passed. By default, you will see all the problems across all the categories. If you click on one of the categories at the top of the page, you tell the tool to only display problems related to that category for right now. This can be helpful when you have lots of problems to deal with across different categories (a divide and conquer approach to problem solving). A bit of information about each error or warning appears in a Problems list below this summary. If you want even more details on a particular problem, there’s a More Info link you can click. That opens a new page with an explanation of the problem that the testing flagged and should provide enough information to fix the problem. You can get more detailed results for a particular category by clicking on that category in the image above. There’s also a Show All Tests link at the bottom of this page if for some reason you want to see every result, passed or not. SuperTool and Domain Health are good ways to run a wide range of tests quickly. There are also specific tools for those times when you want to take a more focused approach. For example, you might be specifically concerned about a problem with your domain’s MX records. Or certain users might be experiencing DNS errors when they try to visit certain domains. MX Lookup checks the MX records of the domain associated with whatever you enter into the text box. However, it does so by popping you back into the SuperTool and running the MX test there. So the results you get here are the same as you would if you entered your search item into the SuperTool directly. If you click the Find Problems button that appears in your test results, you’ll end up in the Domain Health service checking the health of whatever domain is relevant for the search item you originally entered. Blacklists asks for the domain or IP address of a mail server so it can see if the mail server appears on a blacklist. If you enter a valid domain name or IP address, you’ll find yourself back in the SuperTool for the results. However, if you enter something else, such as an email address, the results can be a little different, as you can see here. Blacklists may come back to you for more information. Why? It has discovered more that one item that it can check against the blacklists. It needs you to tell it which item you want it to check. At first this might seem silly. Domain Health does hundreds of tests for you automatically. So why doesn’t this test simply check all the possible options? The answer is the Monitor This button you can see in the figure. We’ll be covering monitoring in detail a little later. For now what’s important is that you may face limits to the amount of blacklist monitoring you can do, so the service needs you to address each possibility individually here. Diagnostics, more completely SMTP Diagnostics, runs several tests on the SMTP server associated with the item you enter into the text box. Specifically, it checks for an SMTP Open Relay, confirms that there is PTR (Reverse DNS) record, and check the response time of the SMTP server. If you do not know the actual address of the mail server that you want to diagnose, you can click the MX Lookup link at the bottom of the page to gather that information before continuing. 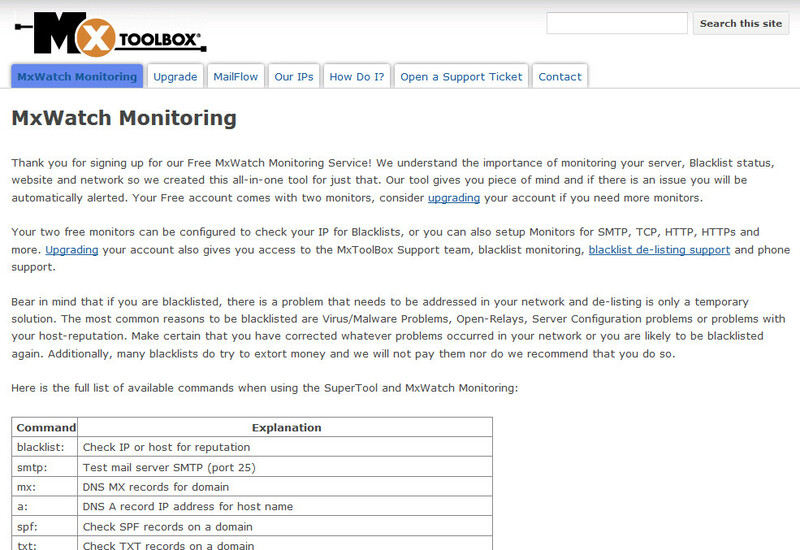 As with the Blacklists service, you will be offered the option to automatically monitor the SMTP server you just tested. 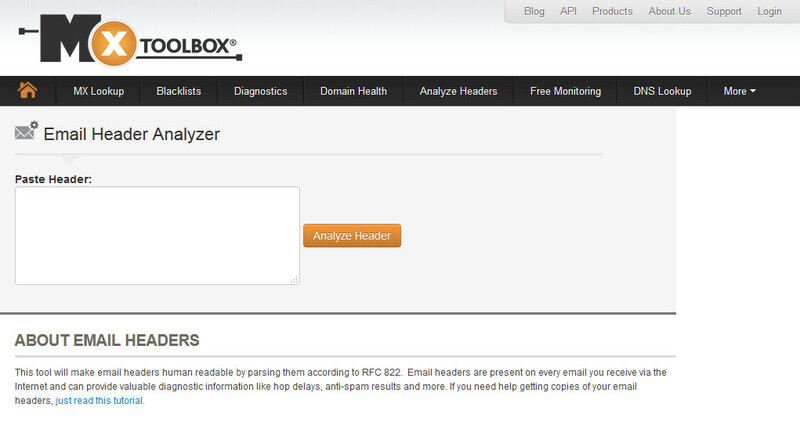 Clicking Analyze Headers takes you to the Email Header Analyzer service. As the name implies, this services extracts any useful information it can from the header of an email message. Be aware that this is a more labor-intensive service than the others we’ve discussed so far. That’s because you must manually paste the header you want analyzed into the service’s text box. Which of course requires you to extract the header from the message. In most cases, if you are interested in this kind of information, you already know how to extract it from a message on your mail system. If not, the MxToolbox team has thoughtfully provided a link to an extensive set of tutorials for doing exactly that on more than two dozen email systems and clients. Yes, I know we’re out of order here relative to the website. That’s because we’re discussing the services before we get into monitoring. I think this will make more sense to you in the end, so please bear with me. Enter a domain name, an IP address, or an email address into DNS Lookup and the service takes you to the results of the SuperTool’s DNS Lookup. You’ll get back the relevant A record, along with related information and links to additional tests. Clicking this somewhat cryptic command takes you to a page that lists all the services individually as shown below. This is simply another way to get at the various services that are offered by the MxToolbox team. Depending on what you are trying to do at the moment, this could be a better way to go than through the all-in-one SuperTool interface. The Free Plan can monitor one (1) item for you, and notify you by email when there is a change. It is also limited in that, when monitoring blacklists, the free plan only checks 30 blacklists, as opposed to the 100+ monitored by the other plans. In addition, this plan only checks those blacklists once a week. The other two plans check their complete set of blacklists several times a day. The Basic Plan is a paid plan that can monitor ten (10) items for you. This includes more frequent (several times a day) and more thorough (more than 100) blacklist monitoring. Beyond that it offers numerous other capabilities. In keeping with the MxToolbox approach of providing additional information right at the point you need it, you can click the names of any of these capabilities on this page and get additional details. If 10 monitors isn’t sufficient for your purposes, you can add additional monitors for a monthly fee. If you need a lot more monitors than the Basic Plan can provide, you’ll probably want to upgrade to the Pro Plan. The Pro Plan provides all the same capabilities as the basic plan, but includes fifty (50) monitors in its monthly fee, along with a price break if you need to add more standard monitors. Let’s walk through signing up for a Free Plan account. Starting at the page above, you click on the Sign Up button on the Free Plan column. This takes you to the signup page shown here, where you create an account if you don’t already have one. After signing up for an account, you’ll receive an email that links you to your Account Settings page. Once you set that up, I suggest you click the Send a Test Message link. This lets you confirm that email alerts will arrive in your Inbox properly. 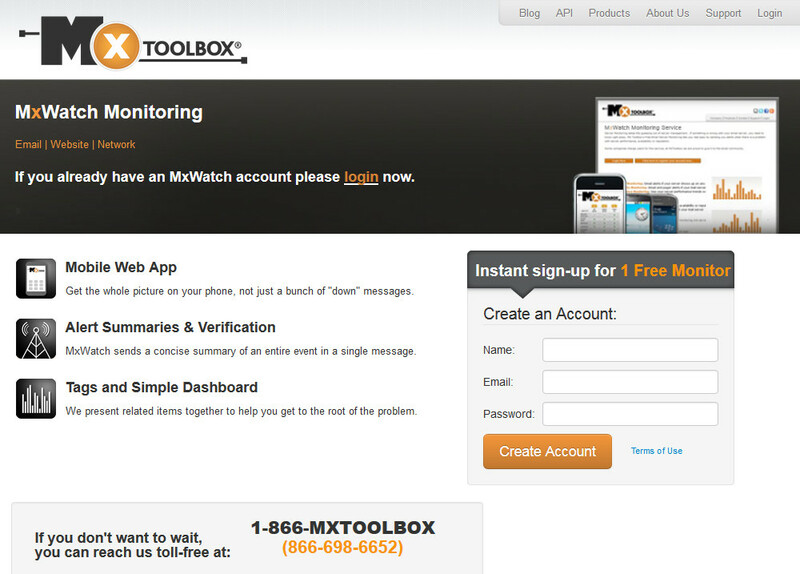 Once you are sure that you will receive alerts sent from MxToolbox, it is time to set up your free monitor. To set up your free monitor, click the Add Monitor tab at the top of the Settings page. You’ll see something very much like the image below, although it will vary somewhat depending on which kind of monitor you want to use. For this example, I am adding an HTTP monitor. It is a very simple process. You just enter the IP address or the domain name you want to monitor and click the Add Monitor button. Once you do this, you’ll end up here (see below), with an offer to upgrade to the next level of monitoring. Once you have monitoring set up and are logged in to the site, you can visit your dashboard. You should see a Dashboard link at the top of every page. At the Dashboard, you’ll find details about everything you are monitoring, along with several links. Clicking one of the items you are monitoring will give you further details about that item. You can also add new monitors, export information in various formats, and look at historical data from the Dashboard. This service performs continual checks of incoming and outgoing mail flow, providing real-time alerts for problems. It also generates a set of performance metrics and historical statistics so you can monitor your system’s long-term trends. This service monitors everything that happens to your DNS. It watches for record changes as well as changes to subdomains. DNS Zone Protect alerts you to such changes immediately. This allows you to watch for both accidental changes that disrupt your DNS Zone and intentional attacks on your system by outsiders. 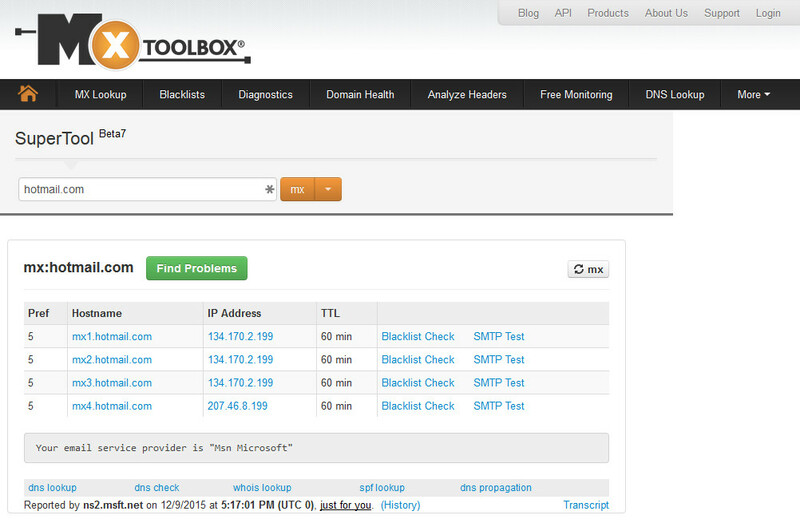 This version of MxToolbox is designed to help you manage large blocks of IP addresses. In particular, it helps you track the reputation of those IP’s as far as blacklisting goes. When an IP address gets blacklisted, that damages the reputation of whoever is using that IP. But as the manager of that IP address, your reputation can be affected too. 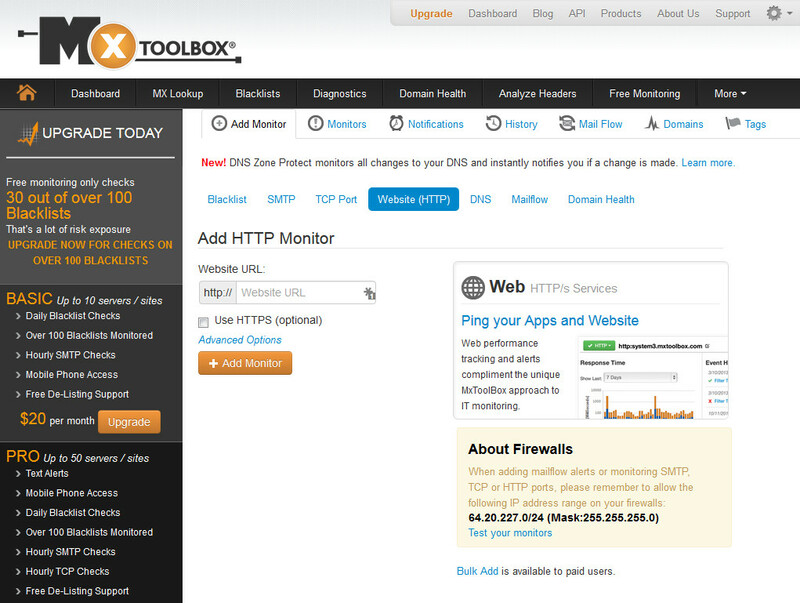 MxToolbox Service Provider edition monitors the reputations of your IP addresses in real-time. This allows you to respond quickly to deal with bad actors and protect your own reputation. This service gives you a REST-based API for tying MxToolbox monitors into your own systems. It gives you the ability to monitor you system using the test from the SuperTool, but with the results integrated directly into your own code. To help you get up and running quickly, MxToolbox gives you access to complete API documentation, along with useful code samples. Pricing will depend on the number of monthly queries/lookups you will need to do. You can get more information by filling out the contact form on this page. This service is based on Zimbra Collaboration, which is used by more than 5,000 companies. It provides secure email, calendar, tasks and other capabilities in a SaaS model. This frees you from the hassles of implementing and maintaining your own system. Beyond the basics, this service includes full mobile support and can replace Microsoft Exchange while allowing your people to continue using Microsoft Outlook as they are now. Pricing for this service depends on your needs. Click any of the yellow buttons on the page to reach a contact form where you can request more information. MxToolbox is a Google Apps Authorized Reseller. If Google Apps for Business is in your organization’s future, you can purchase it through MxToolbox. The MxToolbox team will facilitate the purchase and installation of Google Apps for Business, and provide unlimited phone, web, and email support for the year at no additional charge. Click one of the Contact Us buttons to reach a contact form where you can learn more about pricing. At the time of this review, SaaS Email Protection + Continuity service is being phased out. If you are looking for this kind of service, contact MxToolbox. They are providing people with advice on alternatives. This services works with SaaS Email Protection + Continuity, so you should speak directly with MxToolbox support for more information. 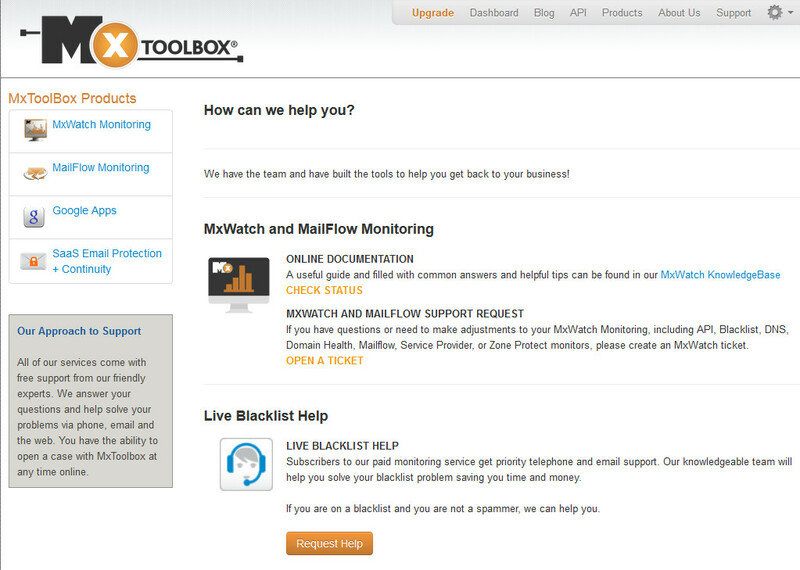 With so many different services being offered, the MxToolbox Support system is crucial. And the support you need is there. It can just be hard to find, particularly if you are using the free monitoring. Your other option is to click the MxWatch KnowledgeBase link. This will take you to the page shown below. 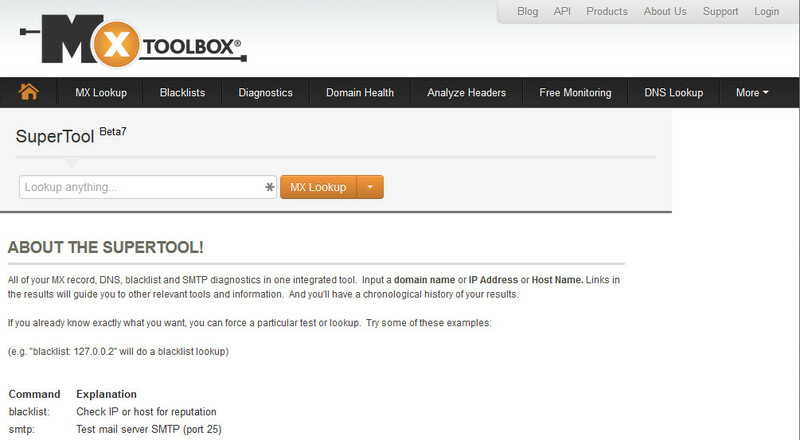 Each of the tabs on this page provides support information on different aspects of MxToolbox. If you can’t find the help you need, you can use the Open a Support Ticket or Contact tabs to try to get additional support. Please note that the main support page says you must be a paying customer to get access to support personnel, so it isn’t clear whether a free user will get a response to requests through these channels. As you might expect with such a wide variety of services you can choose from, the cost of using MxToolbox varies. Dozens of the services, including the incredibly powerful SuperTool and Domain Health services, are free for manual use. If you want automated monitoring, the Basic Plan is $20 per month, and the Pro Plan is $80 per month. You can add additional monitors beyond the defaults to both of these plans, which of course affects the price. Beyond this, there are several additional paid services, with prices ranging from $30 on up depending on your specific needs. I’m very impressed with both the power of MxToolbox’s offerings, and the fact that so many of them are available for anyone to use, free of charge. While testing the free services to write this article, SuperTool and Domain Health showed me several previously-undiscovered problems with my own websites and email systems. If you have any kind of online presence, it will be worth your time to try out these great tools. That said, there is definitely a learning curve involved in using the services and the web site. Finding what you are looking for on the site can be tricky, but if you use the links included in this review, that problem goes away. I found using the SuperTool to be very confusing at first. The multiple non-standard ways to tell the system what you want to test are great. You simply need to get comfortable with them. I recommend that you choose the one you like best and stick to it. The test results are likewise confusing. They return so much information, and so many links to related tests and resources that it can be overwhelming at first. However, once you get comfortable with the way MxToolbox works, I think you will find the results to be extremely useful for tracking down and solving problems. In short, you will need to invest some time to really understand how the MxToolbox services and web site work. Once you do that, you will find their services to be very valuable for dealing with blacklists and other Internet infrastructure issues that threaten your organization. Read more about MxToolbox on DiscoverCloud or our knowledge base. Ready to try this out? Click here to set up your free monitor at MxToolbox.